I have produced long term summer and winter outlooks since 2006. The success rate so far has been approximately 75%. Recent winters / summers have gone well; however, there have certainly been a handful of failures during the 2006-2015 period. In the following analysis, the innumerable variables which influence the atmosphere will be discussed. These factors include but are not limited to: solar variability, mountain torque, AAM, QBO, NAO, AO, EPO, PDO, PNA, SOI/ENSO, MJO/Tropical forcing, stratospheric temperatures and possible analogs. Thereafter, the United States and local outlook for temperature, precipitation, and snowfall anomalies will be provided for the meteorological winter [Dec-Jan-Feb for temperatures/precipitation and first-last flake for snowfall]. The difficulty with long range forecasting is ascertaining which factors might exert the most influence upon the weather pattern. Does internal variability in the Earth-climate system carry more weight than exogenous forcing mechanisms such as fluctuations in solar activity? I believe it is apparent that everything is interrelated to a certain degree, but what is the cause and what is the effect? Is an indicator under examination the root cause of a weather pattern or is it merely a symptom in a long chain of cause and effect? Identifying that initial cause is both extremely difficult and important, because knowledge of the principal driver(s) will aid in improving one’s forecasting accuracy. With that being said, there are numerous statistical correlations that we utilize in long term forecasting which may not have full, causal explanations yet. Correlations, particularly strong ones, can indicate that the behavior of one variable tends to precede/foretell the behavior of another variable. Correlations are one of the most effective long term forecasting methods currently available. Overall, it is important to examine the bigger picture, and refrain from becoming too myopic with respect to certain indicators. One correlation may be suggestive of a cold winter while another might implicate a warm one. The aggregate picture must be objectively analyzed. 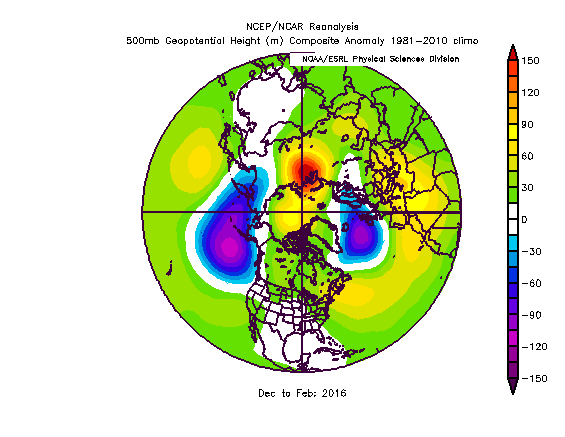 The important variables that typically exert the most influence on the United States winter pattern will be analyzed, specifically, ENSO, EPO, NAO, AO, PNA/PDO. The modality and behavior of these “teleconnection indices” are crucial considering their significant impact on sensible weather. Reasoning will be provided for the forecasts of various indices under examination. Most of the methodology by which I have arrived at my conclusions will be discussed; however, there are some newly researched forecasting techniques which I have elected not to fully disclose at this time. More information regarding these will be provided in the index forecasts. Expectation: One of the strongest El Nino’s on record with a likely Oceanic-Nino Index (ONI) trimonthly peak of between +1.9c and +2.1c in region 3.4. I believe it is reasonable to begin with this oscillation considering it will arguably be one of the most influential indicators for the ensuing winter season. Last winter we saw the initiation of a weak El Nino event with slightly warmer than normal SST’s in the tropical Pacific. Over the course of spring 2015, the frequency and magnitude of westerly wind bursts (WWB’s) increased in concert with the development of eastward propagating kelvin waves. The Southern Oscillation Index (SOI) is often an invaluable proxy for the prognostication of westerly wind bursts. There is usually a proclivity for enhanced (reduced) WWB’s following severe negative (positive) trends in the SOI. The SOI has been predominately negative over the past 6-8 months, and strongly negative in recent months. The October 2015 monthly SOI value was -20.2, indicative of a very strong to “super” El Nino event, falling among a short list of other Nino’s since 1940: 1940-41, 1965-66, 1982-83, and 1997-98. As a consequence of the persistently negative SOI, anomalously strong WWB’s, and the concomitant kelvin waves, this El Nino event has progressed into one of the strongest El Nino’s on record. It appears likely that we will see a peak trimonthly ONI value most similar to 1972-73 and 1982-83 of around +1.9c to +2.1c, which would be more potent than the 57-58, 65-66 strong El Nino’s, and weaker than the 1997-98 super event. Model data is generally suggestive of the climax occurring either this month or in the first half of December, which is fairly close to the climatological peaks of ENSO events. JAMSTEC forecast for ENSO is suggestive of a very strong El Nino, eventually declining into neutral / La Nina territory by late 2016. This “rubber band snap” is quite typical following potent El Nino’s. The MEI is also a useful proxy for ascertaining the overall magnitude of an ENSO event, and it peaked at +2.5 in October, second only to the 1997-98 El Nino since 1950. The Madden Julian Oscillation (MJO) has been quite active as well – something which does not tend to occur in events this powerful. Strong Nino’s usually dampen the MJO wave forcing; however, we have been able to manifest an amplified / coherent MJO signal this autumn. The reasons for which could be due in part to the anomalous SST warmth from the Indian Ocean through the Pacific. Other strong-super Nino’s featured a propensity for cooler waters in those areas, which can reduce the forward momentum and magnitude of a MJO wave. Thus, the magnitude of this El Nino is fairly clear: not only is it strong, but the potency on a basin-wide scale is essentially unseen in the 1950-2015 data base. The type of El Nino we have is very unique in that it’s the strongest, basin-wide El Nino since 1950. What does this mean? The other El Nino’s of similar magnitude featured their warmest waters relative to normal concentrated in regions 1+2 (1982-83, and 1997-98). This El Nino has anomalously warm waters stretching from region 4 (which recorded an all-time high of +1.7c; doesn’t sound impressive, but the average water temperatures are already very warm there) through region 3.4, region 3, and to the South American Coast. The spatial extension is phenomenal. However, the longitude at which the greatest SST anomalies are concentrated makes a significant difference in the resultant pattern. Warmer water further west tends to promote greater available energy, and consequently increased upward motion, condensation, and tropical thunderstorm activity. These thunderstorms can grow very high into the atmosphere, releasing an enormous amount of latent heat, which then impacts the mid latitude ridge/trough pattern to a certain extent. This is why anomalous warmth focused in region 1+2 like the 1997-98 event is quite a bit different than anomalous warmth spread throughout the basin. Different signals are sent to the atmosphere depending upon the location of strongest tropical forcing [essentially a broad term one can utilize to define tropical convection/upward motion]. Useful proxies for which tropical forcing can be identified are outgoing longwave radiation maps and velocity potential at the 200mb level. The former of which identifies areas of convection under negative outgoing radiation and subsidence under positive outgoing radiation. The latter can identify areas in which higher than normal upper divergence occurs, which tend to promote low level convergence and convection. Therefore, the magnitude of the El Nino event will likely be most similar to seasons such as 1972-73 and 1982-83 in terms of region 3.4 ONI trimonthly peaks. However, the orientation / behavior of tropical forcing seems to be more similar to the strong El Nino years of 1965-66 and 1957-58, which featured tropical convection / upper divergence further west than 1972-73, 1997-98, and 1982-83. In totality, we can derive the following from the aforementioned factors: the immense magnitude cannot be ignored. It will be among the strong El Nino’s on record, the strongest basin-wide Nino since 1950; however, the behavior of tropical forcing will be more similar to the Nino’s of 1965-66 and 1957-58. My research has indicated that there is a high likelihood of the maintenance of the recent tropical forcing regime for the ensuing winter. AO Expectation: Negative modality averaged for the DJF period. Mid-late winter should be more negative than early winter. There are various signals which ultimately influence the tropospheric AO signal, some of which originate in the troposphere itself, while others are due to both the stratosphere and the Sun. One question with which one should begin an AO analysis concerns the current state of the troposphere: is there active blocking [because, ultimately, current conditions supersede other indicators]? And if so, what are the mechanisms by which the blocking will either maintain itself or dissipate going forward. As we examine the current state of the troposphere, it is apparent that it devoid of active blocking; in fact, the polar opposite is true: we have a very strongly positive AO. This implicates that either tropospheric forcing or an exogenous force such as the Sun/stratosphere is required to induce a reversal in the AO modality. On the stratospheric / solar front, conditions will remain hostile for November, and possibly the early part of winter insofar as instigating an AO change. The tropospheric pattern is rather unfavorable right now, but there are indications of improvement down the road. An examination of the geopotential height pattern over northern Asia in the month of November could offer clues as to the potential behavior of the northern annular mode (NAM) in the longer range. Specifically, I analyzed the geopotential height pattern over the Barents and Kara Seas region for the month of November. 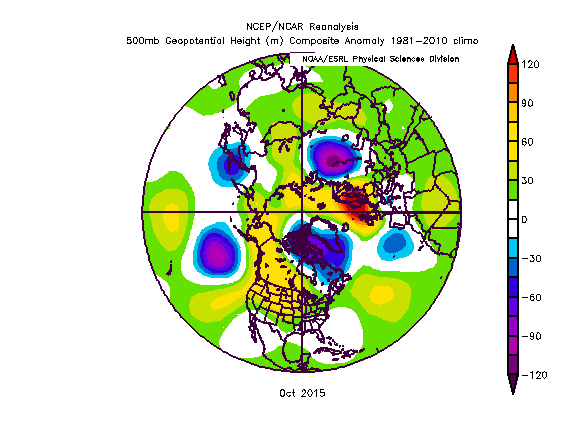 A fairly strong correlation was found between the 500mb height anomalies in November and the DJF AO modality. Higher (lower) than normal 500mb heights in this region for November tend to precede a mean negative (positive) AO for DJF. The meteorological reasoning behind this could be as follows. There is research already present that below normal sea ice in the Kara-Barents Sea region precedes a negative AO winter, while above normal sea ice precedes a positive AO winter. Higher heights in this region not only decrease sea ice anomalies, but more importantly, initiate a downstream pattern by which high pressure builds in Eastern Siberia. This – in turn – tends to initiate wave activity flux / wave breaking and increased heat transfer from the troposphere into the stratosphere. The mechanism induces stratospheric vortex perturbation, and eventually tropospheric perturbation. Thus, the proposed mechanism is that higher than normal heights in the aforementioned Kara-Barents seas region in November increases vertically propagating wave activity which eventually yields an AO change. Research has demonstrated that poleward eddy heat flux at 100mb has a high anti-correlation with the AO modality by approximately 40-60 days in advance. 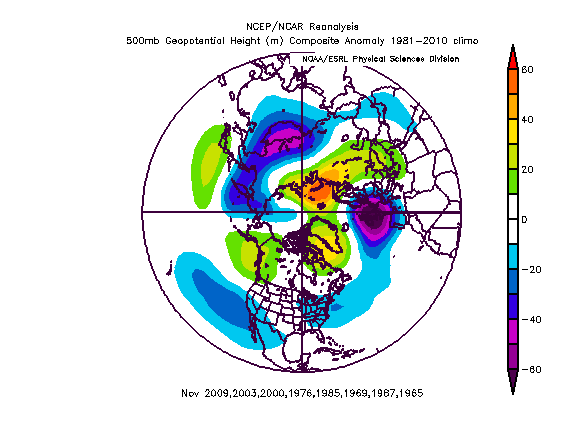 Thus, the November geopotential height method over the Kara-Barents sea region provided high skill in retrospectively forecasting the 1964-2014 AO. 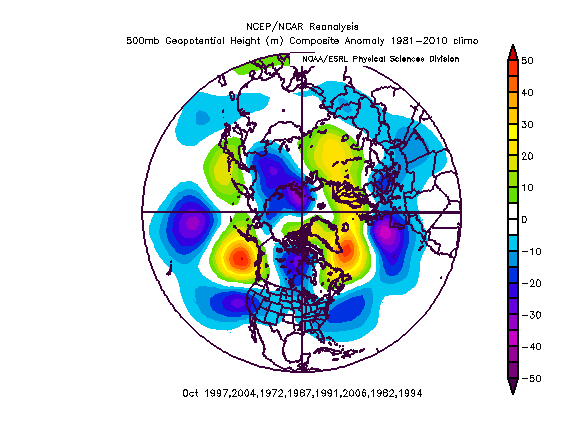 Below are the images depicting the November geopotential height pattern for years with a positive / very positive AO, and the second image, depicting the November 500mb pattern preceding negative / very negative AO winters. Note the low (high) heights in the Kara-Barents Sea region in the precursor positive (negative) AO years. This November, heights have been slightly above normal over the Barents-Kara seas so far with below normal sea ice. The modelled geopotential height pattern is suggestive of higher than normal heights the rest of November, and thus, we should begin to see tropospheric-stratospheric heat transfer increase in a couple of weeks. However, since heat flux at 100mb likely won’t improve for at least two weeks, timing the process out yields an expected AO modality reversal sometime around early January. Years like 2009 featured strong Kara Sea ridging and wave activity flux as early as November 1st, which induced a negative AO by December 2009. The timing this year will probably be at least one month later. The Snow Advance Index (SAI) has been highly analyzed and discussed in numerous write-ups this autumn, so I will simply present the results and implications of this year’s signal. The October SAI has shown high predictive ability for the winter time mean AO state. This October, snow advanced southward (specifically, south of 60N) at a much faster than normal rate, which indicates that the winter AO will average negative. The signal was one of the more robust above normal years in the data base, indicating that the probability is elevated for a –AO winter, especially, if other indicators cooperate. As is the case with any correlation, the method is not infallible. The QBO will be westerly [positive] this winter, the opposite of last winter’s state. The QBO governs stratospheric wind anomalies, whereby the westerly (easterly) state favors decreased (increased) blocking. However, the QBO wind anomaly must be considered in conjunction with solar forcing in order to produce the most effective forecasting tool. There is a relationship between the QBO behavior and stratospheric warming events such that the easterly state tends to promote more warming events in early winter while the westerly state tends to promote more warmings in mid to late winter. Westerly winds delay the development of the stratospheric-Aleutian high pressure cell which usually spreads poleward as winter progresses. Thus, the positive/westerly QBO taken in a vacuum favors an early winter +AO, with any major mid-winter warmings occurring in mid or late winter. Solar activity can modulate the strength / behavior of the stratospheric vortex, and consequently the tropospheric AO (and NAO) regimes. Heightened solar flux and geomagnetic activity have been shown to decrease polar stratospheric ozone, an important ingredient in aiding stratospheric warmth. Conversely, lower solar activity permits the generation of more stratospheric ozone and usually correlates to a higher frequency of major mid-winter warmings. However, solar forcing is best utilized in concert with the QBO as noted. Solar activity is lower than last winter, but still moderate, with solar flux values generally oscillating from 1100-1300. Geomagnetic activity has been more similar to the solar maximum winters, with latest monthly values of approximately 15-16, the highest readings in a decade (2005). I expect solar flux will continue moderately active this winter, with periodic bursts of high geomagnetic activity. It is not until later 2016 that solar minimum conditions will return, as generally defined by persistent solar flux under 1000-1100 per research. A combination of westerly QBO conditions and moderate levels of solar activity produces a dual westerly wind anomaly throughout the stratosphere which intensifies the early winter stratospheric vortex, preventing warming events and thus precluding negative AO initiation. Winters such as 2009-10 featured a negative QBO/solar minimum, which perturbed the stratospheric vortex early on, often yielding extensive tropospheric blocking. This winter, we have strong signals for a December +AO. However, the Holtan-Tan relationship, which involves lower stratospheric winds, tends to become less influential as winter progresses. The flow tends to become more non-linear, and solar forcing has a greater impact. Research indicates that higher levels of geomagnetic / flux activity in +QBO years elevates the likelihood of January or February stratospheric warming event. The Brewer-Dobson circulation which governs the transfer of tropical/subtropical stratospheric ozone to the polar stratosphere corroborates the aforementioned signaling for an early winter +AO. Tropical stratospheric temperatures are running warmer (relatively) which tends to implicate decreased ozone transport. Another wildcard to consider is mountain torque activity. Recently, there’s been strongly positive mountain torque activity from 30N-60N in the northern hemisphere. Rossby waves which circumnavigate the globe are often influenced by mountain ranges – the Asian high terrain being of particular importance. As these waves progress forward, mountain range can sometimes deflect wave activity upward and poleward. This deflection can induce wave penetration into the stratosphere, causing increased stratospheric perturbation. There has been a strong mountain torque spike over the past couple weeks. We will need to monitor potential significant torque activity later this month, as it could couple with a more conducive tropospheric regime for wave driving. In totality, we can derive the following from the aforementioned factors: the Barents-Kara sea ice, November geopotential height method, and the SAI/SCE favor a mean negative AO for the DJF period. The +QBO, Brewer-Dobson circulation, solar flux/geomagnetic activity, suggest the early winter AO state (December) will probably be positive, unless it is overridden by a tropospheric forcing mechanism, which doesn’t appear likely right now. The possible gradual increase in wave activity flux by late November/early December via a more favorable tropospheric geopotential height pattern further corroborates the notion that the AO modality won’t reverse negative until the end of December at the earliest (probably January). Transient –AO dips cannot be ruled out, of course. Expectation: Negative modality averaged for the DJF period. Similar to the AO, the mid-late winter NAO state should be more negative than early winter. Over the past year, I have researched a method which has shown very high retrospective predictive ability for the DJF NAO modality. The relationship examines a variable in the Oct-Nov time frame. Since 1950, the behavior of this pattern in October has shown to accurately predict the DJF NAO modality 78% of the time [14 failures out of 64 years]. When examining November, the behavior of the aforementioned pattern accurately predicts the ensuing DJF NAO modality 86% of the time [9 failures out of 64 years]. The method failed only twice since 1988 [88% success rate]. It accurately predicted the positive NAO of the past four winters. This a new, very important variable which I am utilizing for this winter’s NAO forecast. The autumn behavior of this variable suggests that the NAO will average negative for DJF. 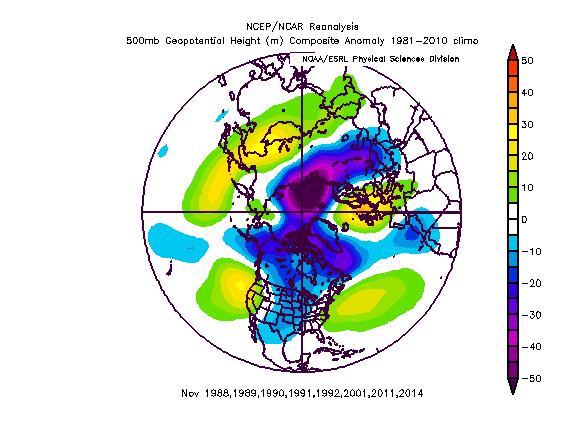 The November pattern to date (and forecasts) has further strengthened the October signal for a mean –NAO. Another variable that I have been utilizing to aid in predicting the NAO state analyzes an aggregate oceanic pattern of the preceding warm season. This method accurately forecasted the NAO winter state in 73% of years from 1950-2014, thus providing a robust correlation, but not nearly as robust as the first method noted above. It also prognosticates a negative NAO winter mean. When both of these methods have been in agreement on the ensuing winter NAO signal, the dual signal failed only once out of 41 years [40/41; 98% success]. Since both of the aforementioned signals are suggestive of a negative NAO DJF mean modality, there is a very high likelihood that the dual method will prove accurate. This significantly increases my confidence on a –NAO DJF winter. However, the method by which we arrive at the –NAO mean may still include at least one positive / very positive NAO month (probably December). Another indicator that has proved useful in prognosticating the ensuing winter NAO modality is the geopotential height pattern in October in the North Pacific. Lower (higher) than normal mid-level heights to the south of the Aleutians tend to correlate to wintertime negative (positive) NAO. This October, heights were below normal in the Aleutians. Additionally, the mean sea level pressure for October was 1010-11mb, which was sufficiently lower than the threshold of 1013mb. This has also shown to correlate to a negative DJF NAO. The following maps indicate the geopotential 500mb height patterns for October preceding the most positive and negative winters on record. Note the tendency for lower (higher) heights south of Alaska in the predecessor negative (positive) NAO years. One can also see from the below maps that most of the positive NAO winters were preceded by a negative NAO regime in October, while the negative NAO winters were preceded by a positive NAO regime in October. The October NAO is inversely correlated with the DJF NAO modality. This October, we have seen lower heights south of Alaska and near Greenland, which favors a winter negative NAO mean. Like the AO, solar forcing and stratospheric behavior modulate the NAO. Note that there is approximately a 0.85 correlation between the AO and NAO index, and thus, the two indices are usually negative or positive concurrently. This winter, the positive QBO / moderate solar forcing implicate an increased likelihood for a December +NAO. By January-February, the solar influence tends to exert itself more-so than early winter, as the influence of the Holtan-Tan relationship decreases. Right now, solar activity should be moderate, with “moderate” level solar flux, and moderate to occasionally high geomagnetic activity. If solar forcing is stronger than forecasted, it could increase the potential for a Jan-Feb mid-winter warming event. However, overall, the QBO and Sun are suggestive of a decreased potential for a major stratospheric warming event. With that being said, it is important to note that stratospheric warming events are not the only causative agents of tropospheric blocking. Many –NAO/-AO winters have occurred in a +QBO backdrop. I expect that tropospheric forcing will become more favorable for a negative NAO by January. In totality, we can derive the following from the aforementioned factors: high likelihood of a mean DJF negative NAO winter. Early winter should feature a more positive NAO. 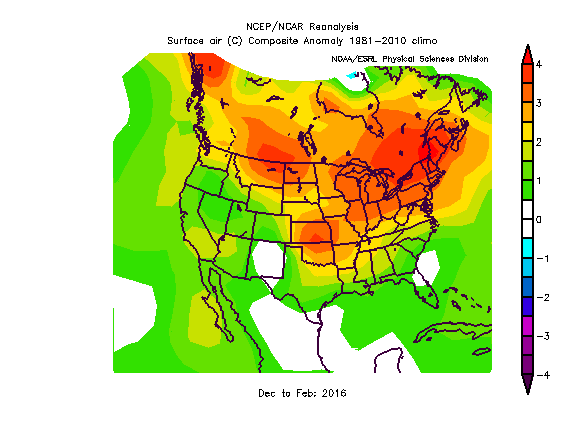 Keep in mind transient interludes of positive NAO can occur in protracted negative NAO episodes and vice versa. Expectation: Positive PDO modality for DJF, and Positive PNA modality for DJF. Another variable which can be utilized as a proxy for ENSO magnitude is the behavior of atmospheric angular momentum [AAM]. Very strong El Nino’s tend to increase the amount of westerly momentum in the atmosphere, while potent La Nina’s have a propensity for decreased angular momentum. 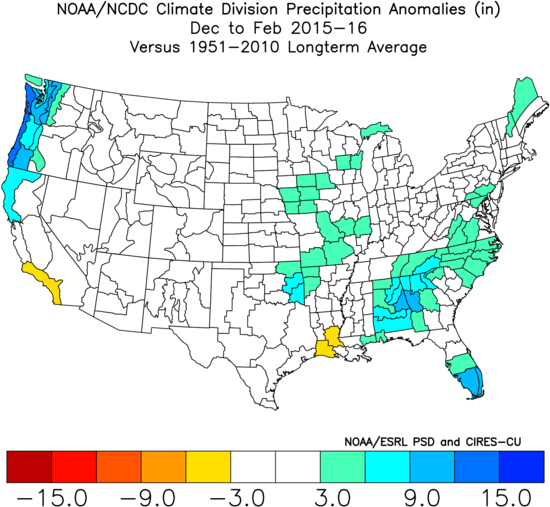 Some El Nino’s, like 1965-66 and 1972-73, occurred in largely neutral / negative AAM states. The reasons for which this occurred are multifaceted; however, the negative PDO of 1965 and 1972 likely contributed to the negative AAM tendency. Cooler water anomalies tend to retard westerly momentum overall. This is partially why the strongly positive PDO state right now has atmospherically coupled with the strong/super Nino, promoting high / very high AAM levels overall. The positive AAM should continue through the winter. Increased westerly momentum can aid in initiating stratospheric wave breaking activity, which is one reason why El Nino’s usually promote warmer stratospheric conditions than La Nina events. The +AAM state should aid other tropospheric features over the next 1-2 months in enhancing wave breaking. With respect to the PDO, every time the September PDO was greater than +1, the ensuing winter DJF featured a positive PDO modality: 11/11 cases, 100%. The 1950-2014 cases of September +1 PDO were the following 1957, 1979, 1987, 1993, 1995, 1997. 1957 and 1987 are the two El Nino’s on that list; however, all years maintained the positive PDO through the winter. The latest October 2015 PDO value continues very positive at approximately +1.5, and November hasn’t varied much. Thus, it is reasonable to conclude the PDO will be positive for the winter, namely, the persistence of warmer than normal SST’s across the Eastern and northern Pacific. Although, I believe the northern Pacific warm pool has been slightly overplayed insofar as its influence on the pattern, there is some value present. Anomalously warm extra-tropical waters can aid in inducing a positive feedback loop such that a downstream ridge remains in place, assuming a stronger atmospheric driver has not initiated. Very warm waters can lower the pressures immediately nearby, promoting the maintenance of a ridge downstream in western Canada. This is likely partially why anomalously warm SST’s south of Alaska correlate to mid- level ridging over the Western US. There is certainly some influence. One can see this in the PNA-PDO correlation. 100% of the aforementioned +1 September PDO cases featured a positive PNA for the ensuing winter D-J-F (PNA data available 1950-2015). The sample size is not robust, so it is prudent to expand the number of years analyzed. If one examines all of the moderate and strong El Nino’s since 1950, the vast majority featured a +PNA signal, the exceptions being 1965-66 and 1972-73. These exceptions corroborate the earlier assertions as a negative PDO predominated during those winters. Another factor related to the PDO is the intensity of the Sub-tropical jet stream (STJ), the latter of which is strongly correlated to the winter precipitation pattern in much of the CONUS. It has been found that warm ENSO events with neutral or negative PDO’s tend to feature a much weaker STJ, while warm ENSO events with positive to very positive PDO’s tend to feature a much stronger STJ. Physically, this makes sense as a +PDO pattern implicates a tight thermal gradient between cold SST’s southwest of Alaska and warm SST’s in the tropical Pacific, which tends to enhance the jet. Negative PDO’s feature a much weaker thermal gradient, and therefore, the STJ is not as intense or moisture laden. This season has a strongly positive PDO, and so the STJ should be more active than usual for the ensuing winter. Zonal winds at the 300mb level of the atmosphere can be utilized as a proxy for the potency of the sub-tropical jet. 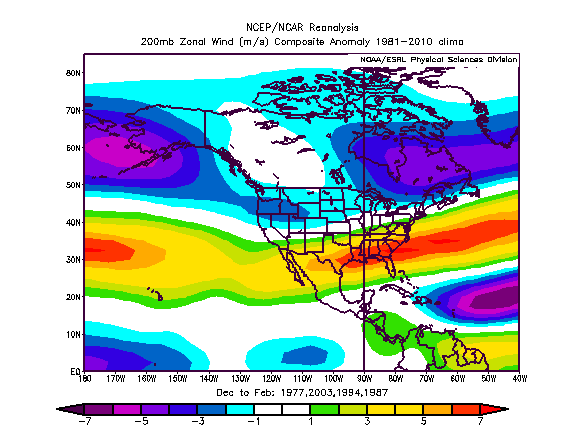 Note the zonal wind anomalies for some strongly positive PDO years: 1976, 2002, 1986 and 1993. Strong positive anomalies can be seen across the southern USA indicative of an intense STJ. In totality, we can derive the following from the aforementioned factors: the likelihood of a positive PDO and positive PNA winter is quite high. The sample size of moderate-strong El Nino’s is very suggestive of the development and maintenance of the +PDO/+PNA couplet signal. Expectation: Averaged positive modality for DJF. However, interludes of negative EPO are likely throughout the winter, occurring more frequent in Jan-Feb. The EPO has been a factor for which significant discussion has occurred over recent years, due in part to the continuation of an anomalously potent mid-level ridge over Alaska for two consecutive winters. This robust mid-level ridging initiated cross-polar flow, driving arctic air into the CONUS. The resultant weather pattern was one which featured very cold Plains/Mid-west winters [and to a lesser extent Eastern US] relative to normal. What caused this negative EPO pattern? While the anomalously warm SST’s likely played a role, there are other factors which probably contributed, including the AAM and tropical Pacific forcing. Negative EPO’s have a tendency to develop more frequently in weaker ENSO years. Additionally, the signal is substantially less frequent in strong El Nino events. As the magnitude of El Nino increases, its concomitant Gulf of Alaskan trough usually expands eastward toward the Western US. Strong El Nino’s generally result in immense / expansive NPAC low pressure cells due in part to the significant input of heat into the atmosphere from the tropical Pacific, and consequently the intensification of the mid latitude jet. The sample of strong El Nino years is quite unambiguous in terms of the EPO winter time signal, namely, there has never been a mean negative EPO for DJF since 1950. This is because the Nino’s magnitude is strongly correlated to the NPAC vortex size/orientation. 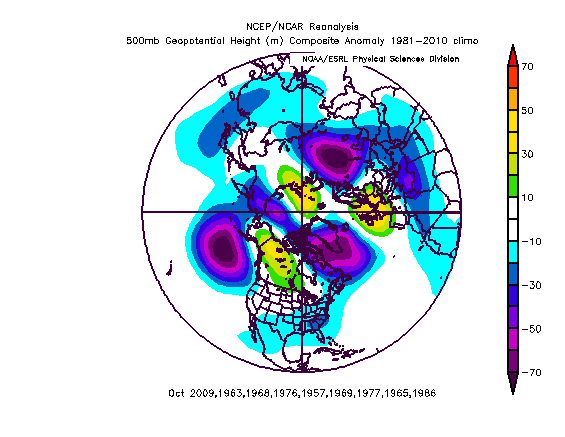 1957-58, 1965-66, 1972-73, 1982-83, 1997-98 all featured a +EPO in the means, although the geopotential height patterns in 65-66 and 72-73 were more atypical due to the relatively low AAM state and –PDO. With that being said, an examination of many of the +EPO / Nino’s reveals that the winter can be somewhat bipolar in terms of the signal, with early winter usually more positive than late winter. I would not express much confidence regarding that tendency, given the statistical insignificance of it. However, as El Nino events mature and begin to weak by their climatological time of Jan-Feb, there is usually a gradual retrogression in mean mid latitude features. Thus, it does make meteorological sense to anticipate a higher frequency of negative EPO bursts in the mid to latter part of the winter. In totality, we can derive the following from the aforementioned factors: The EPO should average positive for DJF, an unfavorable signal compared to the past two winters. There will likely be interludes of negative EPO, particularly in mid to late winter. In light of the aforementioned reasoning, it is apparent that the current El Nino event is quite unique: It is the strongest basin-wide El Nino on record. Additionally, the amplified/coherent MJO waves are highly atypical for a Nino of this magnitude. The backdrop of other indicators makes for an interesting, challenging picture for a long range forecaster. However, in consideration of all the variables, statistical correlations, methods, and current/likely atmospheric features, my confidence is fairly high on the composite winter signal for the United States. The actual temperature / precipitation actual outlook will be for the DJF meteorological period, as I do not believe the skill level is sufficiently high such that one can be confident issuing individual monthly forecasts. With that being said, a more informal analysis will now be provided on the possible evolution of the winter. The preponderance of evidence suggests that early winter will probably feature indicators which are supportive of a benign / zonal flow across much of the northern hemisphere mid latitudes. The indicators examined implicate a strong stratospheric vortex, positive northern annual mode, positive EPO, and positive NAO for the month of December. The climatological progression of strong El Nino events almost unanimously supports the notion of a warmer start to winter. However, I anticipate the sub-tropical jet will be anomalously strong due to the presence of a potent El Nino and very positive PDO. Therefore, storminess should be abundant for the month of December, although temperatures should largely be unsupportive of snowfall for the East Coast. It is important to note that increasing the number of “Darts” thrown at the proverbial dart board will elevate one’s chances of hitting the board. The darts in this analogy are the sub-tropical jet induced waves of low pressure. The frequency of the waves might be sufficiently high such that favorable timing could still result in snow events for the East Coast. An example of this pattern: strong El Nino of December 1957, which was a warm month relative to normal, but snowfall totaled 16” at Newark for the month, well above normal. I am not suggesting that level of snowfall; however, I would not be surprised to see normal or even above normal snowfall in December due to the active STJ, even in a warm month. Still, I would probably err toward less snow than normal on the coast, with the interior Northeast possibly having their snowiest month in December. By January, I anticipate that tropospheric forcing mechanisms will begin to project more strongly onto the NAO signal. Tropospheric-stratospheric heat transfer should progressively increase during the month of December [due to the aforementioned factors explained], eventually leading to a more perturbed stratospheric vortex by January. Whether this leads to a major mid-winter warming or not is difficult to say, but I anticipate that January will feature a more perturbed stratospheric and tropospheric vortex. Typically if there is a MMW in winters with the discussed backdrop of +QBO / elevated solar, it occurs in January or February. Stratosphere aside, the tropospheric indicators should promote a more negative modality to the AO/NAO by January, substantially increasing the probability of achieving wintry events near the east coast. The actual temperature departures, governed largely by an intense El Nino and powerful gulf of Alaska low, and the development of a –NAO, should vigorously oppose one other such that the resultant January temperature anomalies are fairly close to normal. 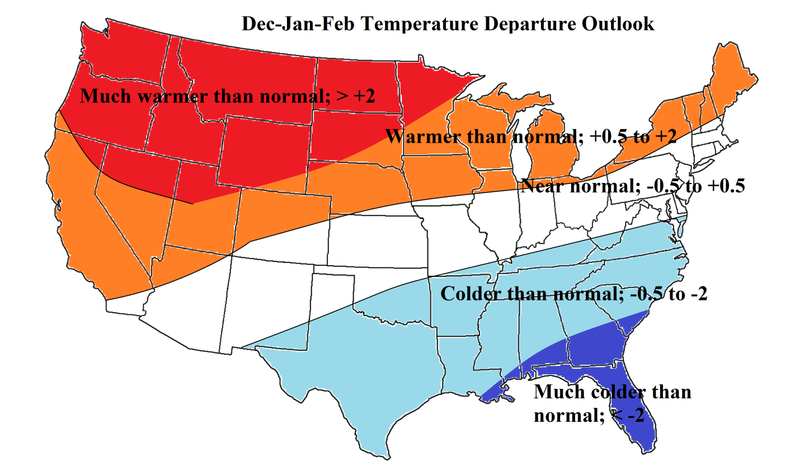 A near normal January temperature wise is still sufficiently cold to allow for the potential of significant snowfall. For February, I have conducted significant research in attempt to find possible reasons to contradict the mean strong El Nino progression; however, the indicators suggest that February should align with the typical strong El Nino climatological progression. Specifically, it will probably be the coldest month relative to normal on the East Coast, which, when coupled with an active STJ, should also yield the snowiest month for I-95 [in accordance with climatology this winter]. The way in which January ends up colder than February relative to normal [though I do not expect this] is if tropospheric-stratospheric wave driving is more rapid / significant than expected over the coming month, yielding an earlier disruption of the stratospheric/ tropospheric vortices. However, due to the climatological retrogression of the NPAC vortex, the EPO should be more negative later in the winter – and this is an index which is significantly correlated with Northeastern US temperatures. Since February is the most likely month in which a negative EPO will occur, February should be the coldest relative to normal. The month of March extends beyond my outlook range; however, if February blocking persists into March, the month will probably begin chilly and active. The active sub-tropical jet via the +PDO/+ENSO should yield a wetter than normal winter across the South and immediate East Coast. 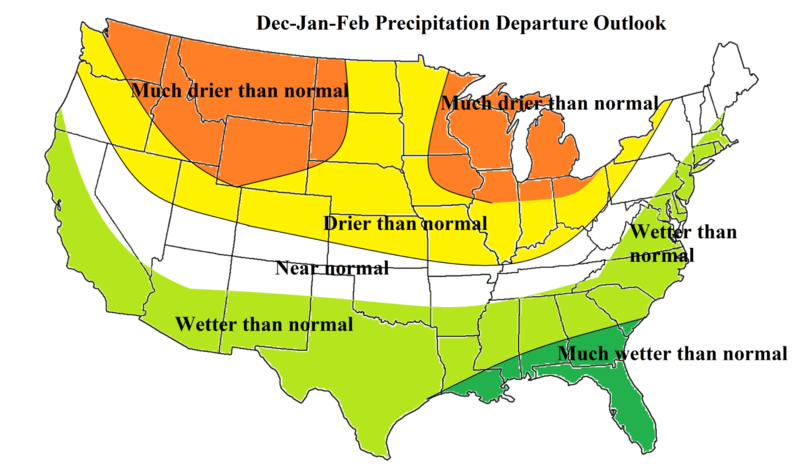 Drier than normal conditions should dominate most of the northern US. Given the likely frequent waves of low pressures propagating W-E across the South, there will be numerous opportunities for wintry precipitation, particularly in Jan-Feb [although, as noted, a significant coastal event cannot be ruled out for December either]. 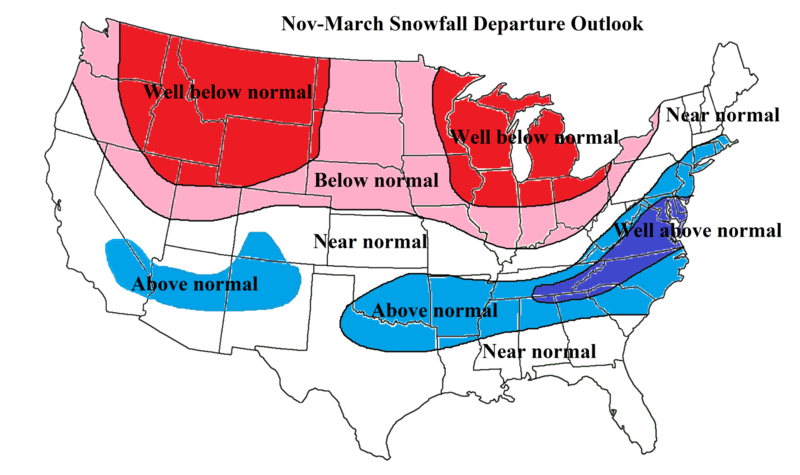 Therefore, I anticipate well above normal snowfall across the interior South/Southeast and up through the Mid-Atlantic. 1982-83 was a winter which featured well above normal snowfall in Washington DC, and its indicators should be much less favorable than this winter. As a result, the snowfall “maximum” relative to climatology will probably extend from the interior Southeast through the Mid-Atlantic. Areas further north, such as PHL, and NYC should have above normal snowfall, but not as anomalous as locations further south. Snowfall should be above normal in coastal Southern New England, but closer to normal as one heads northward, due to less influence from the mid-late winter sub-tropical jet, which I expect will not extend very far north via a potentially potent negative NAO in mid and late winter. The probability of a major or KU winter storm is elevated compared to normal this year due to the likelihood of a moisture laden sub-tropical jet. The favored time frame for such an event is either January or February. As far as analogs, it was difficult to determine sufficient commonalities such that the analog would be useful in the outlook. However, the years which I derived the most similarities from included 1957-58, 1940-41, and 1965-66, as primary, secondary, and tertiary analogs respectively. Less utilized but somewhat similar years included 1982-83 and 1997-98. The primary difference between the anomalously warm strong El Nino’s and the more normal / cooler strong El Nino stratification was the modality of polar indices [NAO/AO], which I expect will average negative this winter. [Not part of the forecast, but expected evolution is warmer than normal December, near normal January, and colder than normal February]. The idea that the Western US and Northern US would be warmer to much warmer than normal was correct (A and B grades). The OH valley into the mid Atlantic and southern new England was warmer than expected, but correct side of departure. Fair grade / C.
The Southeastern US, while correctly forecasted to be the coldest region of the country relative to normal, finished near to slightly above normal, rather than the forecast of colder than normal. D to F grade since incorrect side of departure. Overall temperature grade for the CONUS, around C/C+. Generally correct orientation of departures with warmest northward and coolest southeast, but simply not warm enough in magnitude across many areas. Normal to warmer than normal in the Northeast forecasted; actual was record warm. Correct side of departure (N to +). Thus, a fair call, though not great. Difficult to hit record warmth, so a bit of leeway given. Correct call of wetter than normal East and South, and West Coast. Mid-west was wetter than expected. Excellent forecast overall except that the well below normal across the North should have been extended into Northern New England. The cut-off of above normal snowfall in southern New England was very close (36″ in Boston, near 40″ just south of there). The bullseye of snowfall relative to normal from NYC southwestward through DCA and RIC was very good. Totals of 30-40″ in the DCA-PHL-NYC corridor. The idea that December the ridge would dominate the East w/ warmth, and a transition to troughiness for Jan/Feb in the East was correct. However, blockiness in February didn’t develop as anticipated, though it did for January. The Pacific pattern was well forecasted with a +PNA and +EPO. The AO was slightly negative. The NAO was strongly positive which was the principal bust and thorn in the forecast for February and the second half of the winter. Overall grade for winter 2015-16: C/C+. This forecast was a hit / a fair call overall. However, not as good as the past two years. The lack of February blocking and strong reversal to colder temperatures hampered the temperature call which was not as anomalous for the warmth in the Northeast. The pattern was active enough during colder periods to produce snowfall, which resulted in another above normal snow season for most of the East Coast. The winter will be remembered for a historic blizzard, historic brief cold, and historic warmth overall. Research methods will continue to be improved going forward, specifically insofar as the NAO modality.